Last year Lalanne averaged 17 points, 14 rebounds, 3 blocked shots, and 2 assists a game while being named All-Orlando. His other official visits were Ole Miss, UMass and Virginia Commonwealth. UGASports.com says he has a roughly a 7'2" wing span and shoots the ball well. Rivals has him as the #142 ranked player in the country. If you're going out of state, they need to be Top 150 players. That basically means you're projected as a high major prospect. When we venture out of state to sign kids off the radar like Felton loved doing, it makes me want to put my fist through a backboard (if I could reach one). In my opinion, the Dawgs desperately need a small forward / wing type player to go along with a beefy big man. I hear rumblings of at least one more Top 100 player that may sign, but I'm unsure of position. Fox plays it closer to the vest than Felton did with those around the program so info is tougher to come by. Speaking of UGA hoops, the Macon Telegraph has an article about the defense today. Last week, they did a piece on the offense. Defense is going to come a helluva lot easier to this group than offense. The last coaching staff really struggled to establish or teach any sort of competent ball movement, player movement away from the ball or spacing. The triangle offense needs all three of those things. Oh...and makers instead of shooters. I like where the basketball team is going, but it'll be a work in progress growing into the schemes. The rumblings I'm hearing are all positive. I may not post again til Sunday. Jumping in the car heading to Jax shortly. Can he catch a football? would shawn kemp jr be that top 100 kid? He was around that range on some lists last year. Unrelated, but did anyone else notice our hopes in J-Ville are resting on the Ginger who in the banner picture above didn't even bring his helmet in 07? How many Shawn Kemp Jr's are there? Have a nice trip PWD. upstatescdawg, I think maybe a few. But for us, only one that matters--former Bama commit currently at Hargrave. Lone thought for the game - I think we pull out the play action rooskie play that david greene ran so well. You know the one, where he turns his back and hides the ball. We haven't used it since sc 07. I think its time to break it out again. Go dawgs! Will depend on the video board setup and whether the game is shown live. Beauty of the Greene play....he was watching the play on the board to make sure he didn't get creamed. Man, those black helmets look like high school gear. Enough with the gimmicks! I hope all you "traditionlist" enjoy your ride home. Don't worry, it will be the same for years to come! We wore the black helmets so that people will mistakenly think it was Grambling gettin worked by UF. -11/7 vs. Tenn Tech = "The Grape Out"
purple unies, purple pants, purple helmets. -11/14 vs. AU = "Now You See Me, Now you don't"
-11/21 vs UK = "Orange Crush"
-11/28 @ Tech = "White Lightning"
white jersey, white helmet (no logo), white pants. 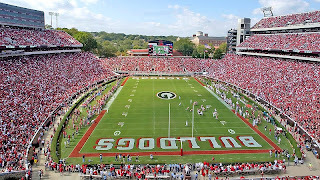 Richt thinks that it is a problem with Cox, and so does Cox.... Might see Gray or Mettenberger for this Saturdays game. Both were elite 11 QB's out of high school (like Stafford, Cox, and Murray as well).